"I named this pen the Momento Zero, to signify the emergence of a new initiative from its starting point." This pen sets the mark - here is a new Italian craftsman house designing and creating truly fine Italian fountain pens. I am very fortunate to have the Momento Zero, No 1 of 1. 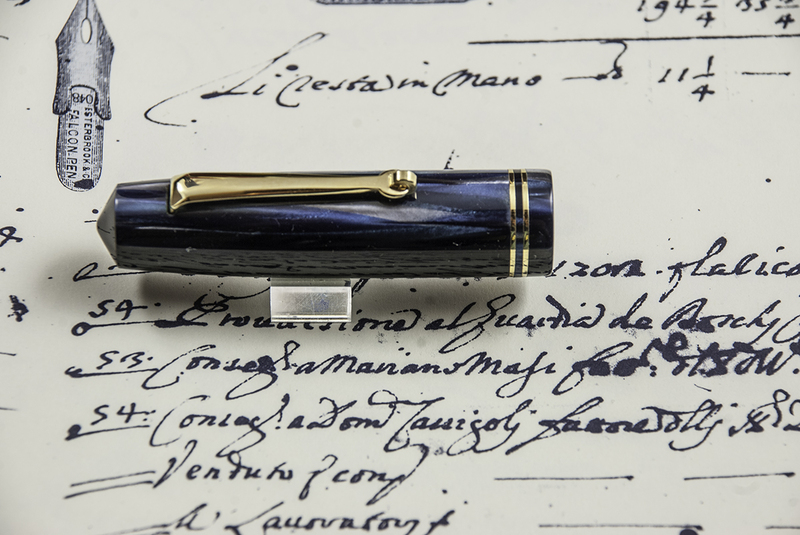 This is a pen designed and created by a new Italian pen company - Leonardo Officina Italiana. Officina means is a workshop where goods are crafted, and Italiana of course means what one would expect, with Italian style. This pen is manufactured by hand, using the equipment needed to bore and polish rods of celluloid. It is an artful craftsmanship method, rather than a volume process to manufacture fountain pens. Information on the company, Leonardo Officina Italiana. I remember all so well when I acquired my Memento Zero when I was in Rome in September 2017. I was on the patio deck of our apartment on the Piazza Cavour. The pen was in a subtle gray box. The name, Leonardo Officina Italiana was printed in a clean modern font. I opened the box, the beautiful blue pen sparkled in the afternoon daylight. The patterns in the celluloid reflected back the light and there was a rich array of colours. 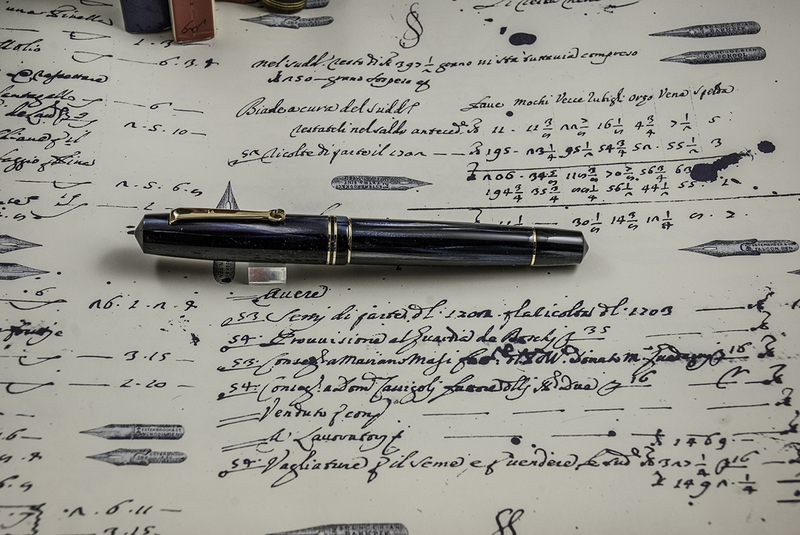 The pen is made from a beautiful rod of celluloid, a material with the characteristic of building a relationship of light and the pattern of the material. Celluloid is found in high-end fountain pens. Cotton is the start of the process, it is processed, formed into a past, colours are added, chemicals added and in the end, it is baked for long periods to form beautiful rods of celluloid and that can be used to create pens. 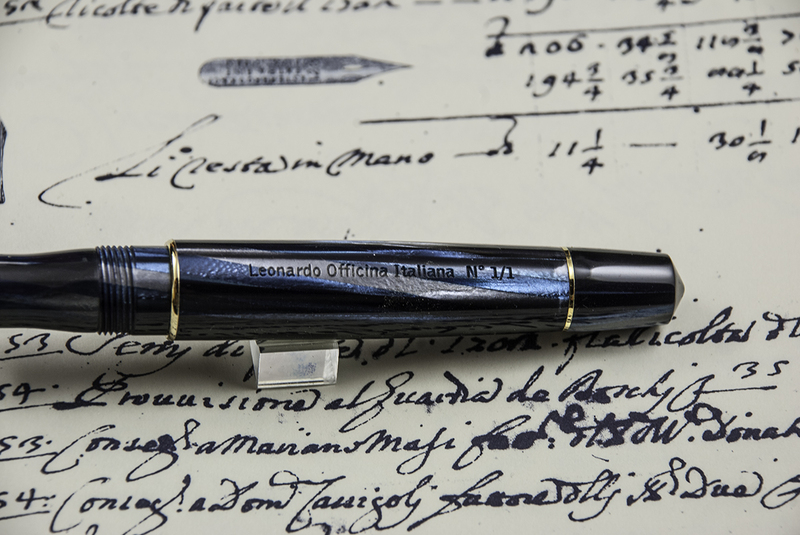 Leonardo has acquired a supply of beautiful Italian celluloid for their pens. Likewise, they have also have acquired rods of resin for pen bodies made from resin. That enables them to make pens at different price points. Celluloid pens standout in how the light interacts with the colours of the material. For me, when the natural light fell on the blue tones of the celluloid body and cap, the pen came alive with colour. From a distance, with no light falling on the pen, the Momento Zero appears as a dark toned, almost black fountain pen. Classic in appearance, good style, and beautiful gold plated trim that includes two rings at the base of the cap, and an attractive clip. I would be pleased to have the pen in classic black. But as light hits the pen, it changes. As I held the pen in my hand to write with it, the light caught the and brought all the subtle and vivid colour tones. There are beautiful streaks of blue, aqua, silver and gray. One of the characteristics of celluloid is its light weight. This pen floats in the hand. The celluloid, combined with a converter as compared to a heavier piston fill mechanism, results on a featherweight pen and nicely results in the hand as I write. As people have picked up the pen they most common comment is how light the pen feels in the hand. The pen is an excellent size. It measures much the same as the Pelikan M800, with the exception that the body, especially for the area just about the nib which is a bit wider. I like that, it gives the pen a good substantive feel. The M800 is considered by many pen owners as a very popular size of writing instrument. The Momento Zero is 142 mm in length when the pen is closed; without the cap on the pen it is 129 mm. Capped, as I usually have my pens, it is 170 mm. The body width is good for my hand at 15.3 mm. My version of the pen uses a converter for its ink filling mechanism. The converter is the extended version that uses the entire length of the inner body. Screw off a cap at the end of the pen, the twist a small nob to expel in draw up ink. The regular production of the Limited Edition pens have a piston filling mechanism. 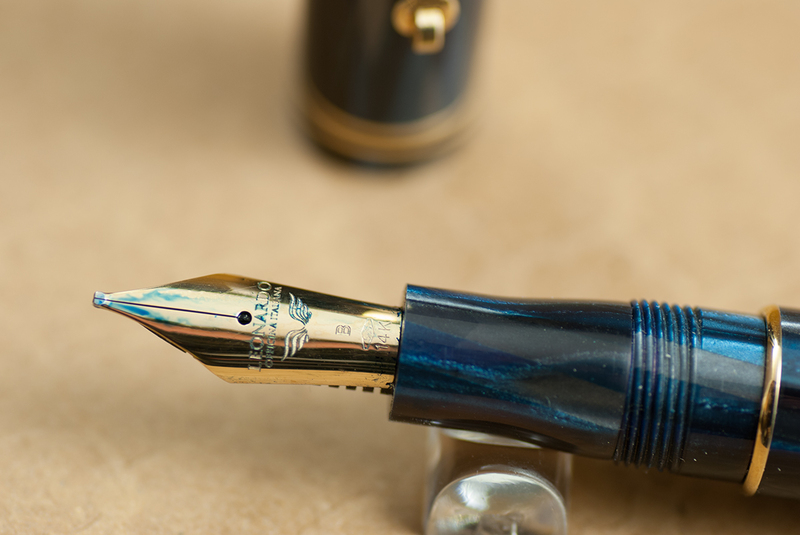 For fountain pens, it is all about the nib, as the nib plays an important role in defining the writing experience. The Limited Edition pens come with a 14 kt gold nib. The nibs are available in Extra Fine, Fine, Medium, Broad and Stub. I have a beautiful Broad nib in my Blue Abyss and is creates a smooth writing experience. From the moment I dipped the pen in a bottle of ink, and tested the pen I found the pen to be a very smooth writer. The nibs sits on a high quality ebonite feed mechanism, and the ink nicely flows from the converter to the nib. Having the higher qualify ebonite feed enhanced the writing experience. At work I have the pen uncapped on my desk, I pick it up, and its writes without hesitation. 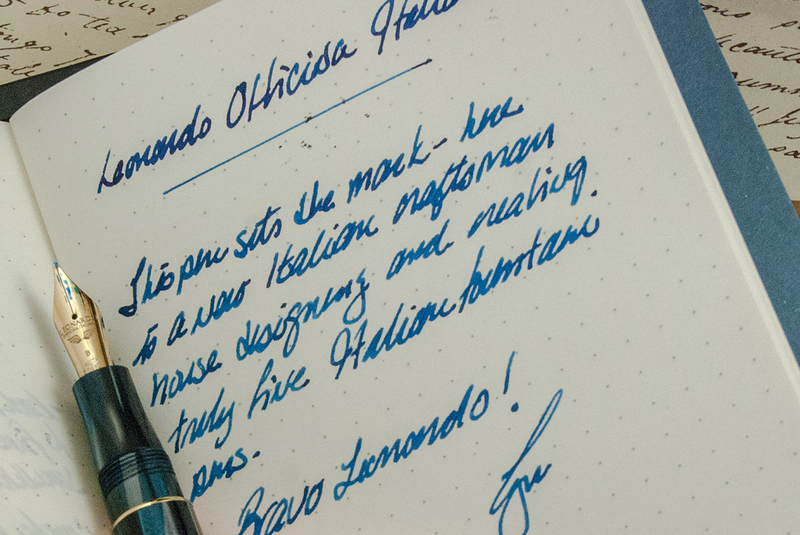 The nibs have the name LEONARDO imprinted. this is a very smooth writing nib. It is a medium width and I have enjoyed using this nib where I need slightly finner writing. The clip of a pen is a very important aspect of its design. Clips can range from being too small to being too large and clunky. Sometimes the design of the clip overtakes the overall look of the pen. The Momento Zero has a very classic subtle clip. The clip runs about 3/4 the length of the pen cap. At the end of the clip a small roller aides in allowing the clip to effortlessly slip over the shirt pocket material. It has such a classic look and so very suited to the overall look of this pen. The cap of the pen can also impact the style and look of a pen. In this case, the cap of the Momento Zero is the same length as the cap of the Pelikan M800. With the Momento Zero, the cap is in the same celluloid material as the body so visually it smoothly blends into the overall look. I write with my caps posed, and this cap nicely posts to the body of the pen. The body is round, and I never like to leave a pen, without the cap closed or posted to the pen. The pens are available through a number of quality pen dealers. I was just recently at Novelli Pen in Rome and acquired another Memento Zero, the Vintage Brown in Resin. Bravo Leonardo Officina Italian! You have created a truly fine pen. I look forward to your other creations.